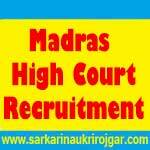 Madras High Court Recruitment 2017 – 127 Sweeper & Sanitary Worker Posts:- High Court, Madras has published latest notification for filling up 127 posts of Sweeper & Sanitary in the Madras High Court Service on direct recruitment. Desirous & eligible candidates can apply in prescribed format on or before 20/07/2017. Educational Qualification: Pass in VIII Standard or its equivalent. Application Fee: Rs. 250/- to be paid only by Demand Draft drawn in any Nationalised Bank in favour of the Registrar General, High Court of Madras, payable at Chennai. The candidates belonging to S.C/S.T. and Destitute Widow are exempted from payment of Fee. Last Date for Receipt of Applications: 20/07/2017. Application Procedure : Eligible candidates can send their application in the prescribed format along with all essential documents by registered post to the Registrar General, High Court, Madras 600104 on or before 20/07/2017. Subscribe our free job alert mail for Madras High Court Recruitment 2017.